Coastal San Diego was shrouded in dense fog Saturday night and Sunday morning as temperatures plummeted from Thanksgiving’s record highs. 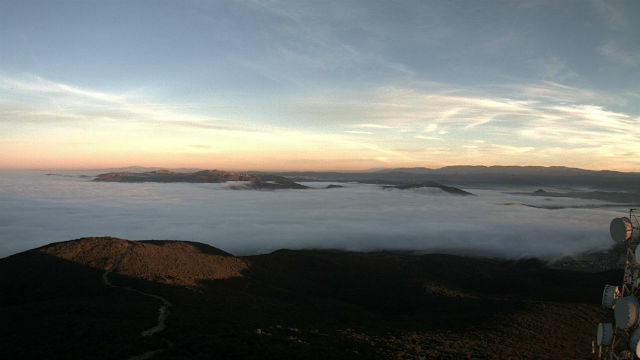 The National Weather Service office in San Diego issued a dense fog advisory, and warned of visibility of less than one-quarter mile. “The fog will persist within 10-15 miles of the coast into mid morning before mixing out,” the weather service said, after which a more moist and cooler airmass will spread farther inland. A number of early-morning flights into and out of San Diego International Airport were canceled or delayed. The forecast for Sunday called for highs 64 to 69 along the coast and 70 to 75 inland. The fog was expected to return overnight, but be gone by Monday morning, when light showers are possible.